Wonderful hostel to stay, facilities were great, breakfast included was great also. The hostel was so clean and very modern, the a/c in room & bath room were a solid 10/10. Staff were so friendly and helpful, we arrived at 6am after the overnight train from Nha Trang and they let us in early which was a great relief and really appreciated. 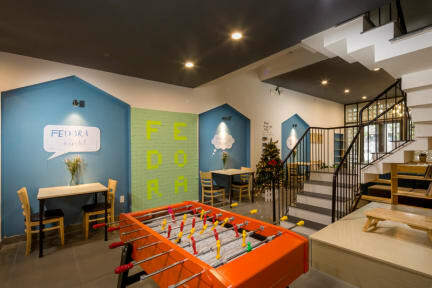 I have no complaints about this hostel whatsoever, would thoroughly thoroughly recommend! I stayed here just for one night as I had a flight early next morning and this place was perfect. Really clean and really well decorated which makes the difference! Nice atmosphere felt safe and cosy. Staff were also really friendly and helpful too. Perfect for one night before traveling to the airport. Beds were comfy and spacious. The hostel was clean and tidy and the staff were very helpful. Great value for money! Not a great area for exploring Danang. Staff lovely, rooms lovely. Only downside not close to centre and very close to airport so planes fly over very close and loud, it didnt disturb my sleep too much as they fly less frequent at night, but something to consider if you need to be up early. Perhaps because it is not a very tourist dense city, the hostel felt somewhat abandoned. We didn’t ever meet any fellow travelers. The staff were friendly, but at times there were some language barriers. Not our favorite breakfast, but free is always good. Stayed here a couple nights after arriving at Da Nang airport. The beds are nice and are capsules with a curtain so privacy was good. Hostel a bit difficult to locate. The bathrooms and showers were fairly good. Friendly staff on arrival. However, there was a strange atmosphere, and one night somebody came into my room, turned the air con off and left with the remote. I had to go down to reception at 6am to get the remote back and when I asked, the guy just stared at me before I took it. This place was very convenient if you need a place close to the airport for a night, and was very close to the bus route for Hoi An, but was a good 45 minute walk into the centre if town. 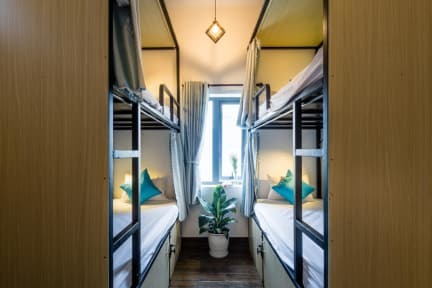 The staff were friendly and the layout of the dorm made the beds feel private, but the uncomfortable pillow and mattress combined with the constant sound of aeroplanes taking off and landing made for a bad nights sleep. We stayed here because of its proximity to the airport. It was absolutely sufficient for this purpose. As some said the beds were a bit hard but if you’ve ever camped it’s fine. Showers had no soap but it’s a $5 bed. The most unfortunate aspect was the kitchen. There was open loaves of bread (likely used for the breakfast) next to open bags of trash containing food waste. There were cockroaches and rats in the surrounding area so I wouldn’t be surprised if a few dined at the Fedora. The beds were fine and a lovely shower. But the bathroom was very dirty..